Wirkkala was one of the most popular players to ever don a Fremont uniform. But his hopes to play in the major leagues would end on the battlefields of France. 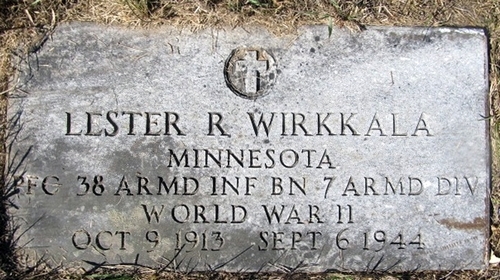 Lester R. Wirkkala, the son of Juho and Elisabeth Wirkkala, grew up in Sebeka, a small town in the primarily agricultural area of central Minnesota. A celebrated player during his school days at Sebeka High School, Wirkkala pitched for the Sebeka Stingers in 1932, the league champions in the amateur OTW (Ottertail, Todd and Wadena counties) League, and runners-up in the state Class B tournament. Wirkkala began his professional baseball career in 1935, when he signed with the nearby Brainerd Blues of the Class D Northern League. He pitched just four games for the Blues for an 0-1 record before being sent home. But Wirkkala was back in the Northern League in 1936, signing with the Wausau Timberjacks. He made 18 appearances for a 2-4 record, and a further 16 appearances for a 1-4 record in 1937. In 1938, he joined the Beatrice Blues of the Class D Nebraska State League, where he was 2-5 in eight appearances, and joined the Fremont Green Sox of the Class D Ohio State League following the disbandment of the Nebraska circuit in July. Wirkkala pitched well during spring training with the Mud Hens in 1940, and secured a spot on the pitching staff after an early season 3-2 win over the Milwaukee Brewers. He became a real workhorse for the Mud Hens over the next two seasons, making 39 appearances (24 starts) in 1940 for a 9-13 record and 4.82 ERA, and adding 37 appearances (20 starts) for a 12-10 record and 4.06 ERA in 1941. At the close of the season, Wirkkala secured a job helping to build the reception center at Camp Perry, the U.S. Army's training camp at Lake Erie, Ohio. He was due to report to the St. Louis Browns' spring training camp for 1942, but was inducted for military service on February 5, ironically, at Camp Perry. Wirkkala trained at Camp Polk, Louisiana, with the 38th Armored Infantry Battalion of the 7th Armored Division. In March 1943, the division moved to the Desert Training Center in California, for five months of training and maneuvers. It was assigned to Fort Benning, Georgia, in August 1943, and left for England in June 1944. In August 1944, the 7th Armored Division arrived in Normandy and made an offensive sweep across France during which it helped liberate such cities as Chartres, ChateauThierry and Rheims. On September 7, 1944, Wirkkala was a light machine-gunner with Company B of the 38th Armored Infantry Battalion when they encountered German forces near the French town of Gravelotte, about 30 miles from the German border. The enemy was engaged in combat and defeated but Private First Class Wirkkala, who had been in France less than a month, was killed in action. His body was later returned to Sebeka, Minnesota, and now rests at Mantyla Cemetery, a small rural cemetery on the outskirts of the town. I am especially grateful to Nancy Koebel at the Birchard Public Library of Sandusky County, Ohio for help with this biography. Thanks also to Astrid van Erp for help with photos and information for this biography.